Need new and quick school lunch ideas for your kids? Worried about getting them to finish their meals at school? Find out how to make things simple this year by checking out my school lunch tips and these 10 tried-and-loved Easy School Lunch Ideas! They’re all vegan, healthy, and include allergen friendly options! My youngest is 3 weeks into kindergarten, and mommy is loving the break after 7 years 🙂 I think the fact that my kids were home the entire summer made it easier, since I really needed the break. The first day was definitely tough coming back to an empty house. The thought of them being in school everyday and all the after-school activity craziness makes me wish I could keep them at home for those lazy days. But, I’ve come to find a new balance in my life that I’ve pushed off for the past 7 years. This newly available time is very liberating. I no longer yearn for those few minutes alone, trying to cram in all the other work during any spare time, or craving that alone time on the weekends. Plus, 5 hours goes by pretty FAST, and it’s very refreshing to have them come home. Starting school also comes with having to pack school lunches everyday, and now I have to pack for two kids and get them out the door on time. I’ve been experimenting with school lunches the past few years and finally found a balance that works best for my kids and myself. This is the first of a series of school lunch posts I’ll be doing throughout the year, and I’m hoping they’ll help those of you looking for new, quick and easy vegan school lunches to bring into the rotation. Before I dive into this first round of 10 Easy School Lunch Ideas, I wanted to talk a little more about school lunches in general, and what I’ve found works best for my kids. This includes the stresses of trying to get them to finish their meals, how to make school lunches easy, and the school lunch supplies that I currently use. If you prefer to skip everything else and jump straight to the school lunch ideas, just click here. I even created a summary printable recipe card for all of you that includes the 10 school lunchesfor all 10 school lunches at the end of the post! 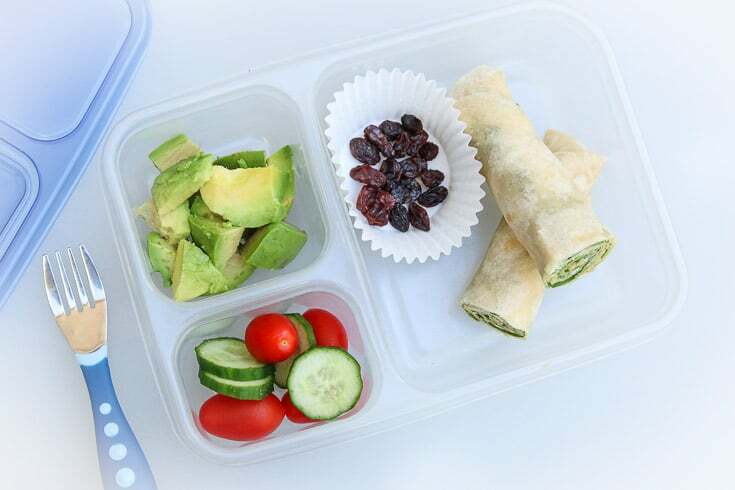 There are two different types of school lunches: the bento-box style that have small relatively equal-size portions of several items and the traditional meal with one main entree + a few sides. 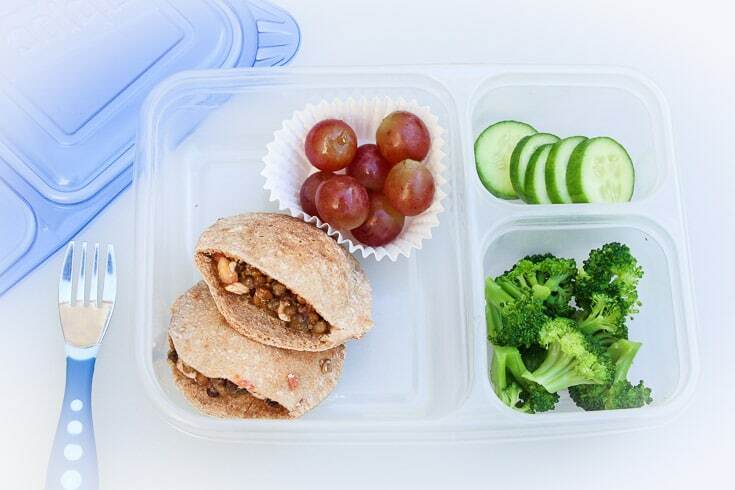 I’ve found that the meal-type school lunches work best for my own kids at this younger age because they can focus on trying to finish one thing as opposed to an assortment of items. That way if they don’t end up finishing their sides, I’d still feel like they had enough of a lunch. It goes back to that concept of giving them too many choices. And if your kids are anything like mine (especially my youngest), they end up chatting a lot with their friends during lunch and get distracted pretty easily as it is. On the flip side, meal-type school lunches can appear quite boring to some kids and not as exciting to eat. The bento-box style may also at times be easier to pack since you’re not worrying about having one main item to send each day. What’s best for your kids? What motivates them to finish their lunches at school? What types of foods are they into? Are they picky eaters? Although it’s only been 3 weeks, my 7 year old is now at a stage where he’s coming back with his school lunches completely empty (finally)! My 5-year old on the other hand…let’s just say we’re still working on it, haha! If I were to give her some raw hard veggies in a bento-style lunchbox, she’d probably still be gnawing on the carrots and broccoli the entire day if allowed. She’s still getting used to eating her lunch in a shorter amount of time while socializing. I guess it doesn’t help that she’s in a class full of her friends 🙂 But hey…that’s what kindergarten is all about anyway right?? Having fun, socializing, and hoping they learn something along the way. 50% of my decision on what to pack for school lunch is based on what I have in the fridge, how much time I have to pack it, and whether or not I planned ahead of time (which doesn’t happen very often). I’m that mom that needs to make sure the kids are getting their nutrition, fueling their bodies, and hydrating throughout the day. It’s even more important for kids at a young age to get into a habit of eating right and knowing what they’re putting into their bodies. My kids are very high energy. They love playing sports and their brains are constantly working. So if they come home from school not having eaten any proper snack or lunch, and/or not having drank enough water, it effects them the rest of the day. Figure out what types of foods they are into. Are they picky eaters? If so, maybe come up with 3-6 different ideas and just rotate through them. Give them a few weeks, try new ideas (more than once), and see what works best. Talk to them. Ask them why they didn’t finish their lunch. Maybe they loved what you packed but were just too busy chatting (ahem…both my kids), or maybe they didn’t like one part you can easy sub out. Start small. Don’t over-pack. It can be overwhelming for a kid to feel like they have to finish all of the food you packed. Make it achievable so that they get excited when they finish. Incentives and Motivations. Just like most things, kids just need to get into the habit of eating their lunch at school. What motivates them to finish? Give them incentives. I used to make extra TV time lunch charts for my son for when he finished his lunch (or even ate half of it, if that’s where your kid is at). Talk to their teachers. This is especially helpful when they are in preschool or kindergarten. Their teachers can help motivate them and remind/encourage them before they’re dismissed for lunch each day. Sometimes that’s really all it takes, especially for the younger ones. Pack a Treat. I always pack a small treat with lunch to encourage them to finish. Include fun notes or jokes. Make school lunch fun by including easy notes, stickers, and/or jokes! My kids love them! 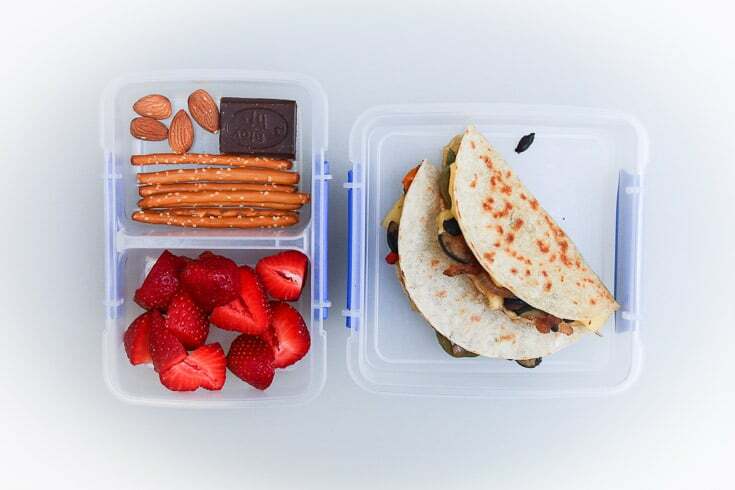 For a few of the easy school lunches below, you’ll see me using these containers with 3-compartments. I stopped using them early on mainly because of their size and durability. 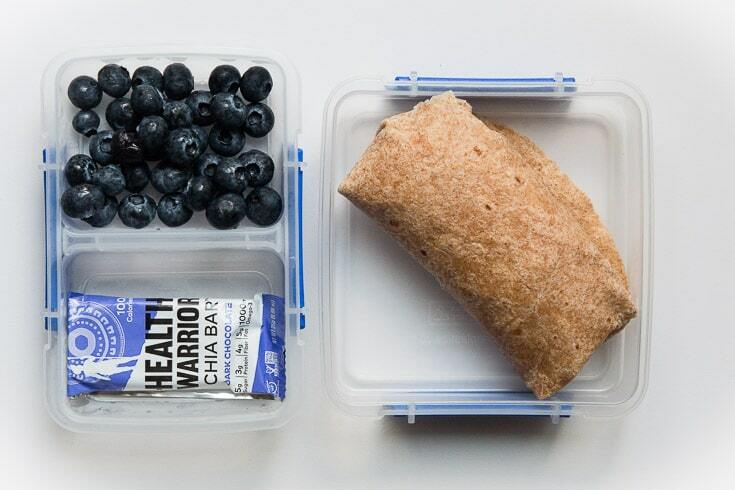 Let’s face it, no matter how prepared you are, figuring out what to pack for school lunches isn’t always easy. I’m a morning person. I like to wake up early, get my workout in, shower, and get ready before the kids go off to school. That leaves me with about 25 minutes to eat my own breakfast, make sure the kids finish theirs, pack everything, and get them out the door! I’m also not one who preps the night before. Once the kids hit their pillows at night, it’s me-time and I’m done for the night as far as kid-stuff goes. So how can you make school lunches easy? Here’s what works for me. Two days out of the week we do sandwiches (peanut-butter-jelly, almond-butter-jelly, or a few other staples I share below). The other three days are based on what I have available. Many times it’s leftovers from dinner if I think the kids will eat it at school, and other times it’s burritos/tacos, pulling a sauce out of the freezer for a quick pasta, or a bento-style lunch box if I don’t have a main. I try to give them a variety of different foods throughout the week to form well-balanced meals that fit our personal diet. Snack is always one fruit + something else (such as pretzels, bars, coconut oil potato chips, veggies, sweet potato chips, vegan cheese crackers, banana chips, sesame sticks, roasted seaweed chips, etc.). So really it’s those 3 additional days every week where I need to come up with something other than a sandwich. And all you really need are a few ideas that you know your kids will love. 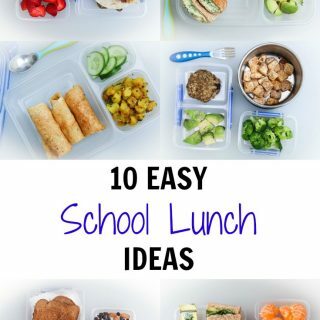 I, for one, am definitely not going to come up with unique ideas for them every single day, so I just find those 10-15 easy school lunches and keep rotating throughout the year! 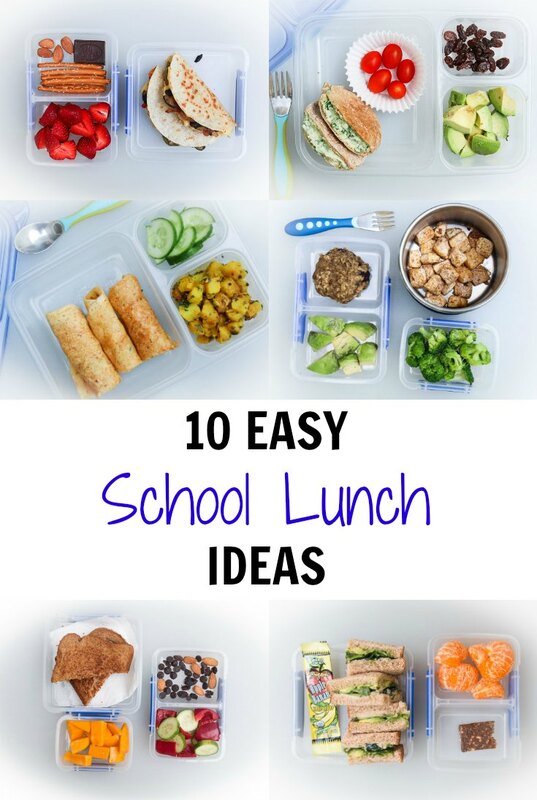 If you’re still shaking your head, I’ve pulled together 10 easy school lunch ideas to share with you guys today! Hopefully you’ll find a few you love or it’ll give you some inspiration on what to pack for your own kids. And don’t forget, this is the first of a series of school lunch posts I’ll be doing throughout the year, so there’s still more coming your way! I use the creamy almond butter or creamy peanut butter from Trader Joe’s. Use Persian cucumbers for smaller one-bite hummus sandwiches. 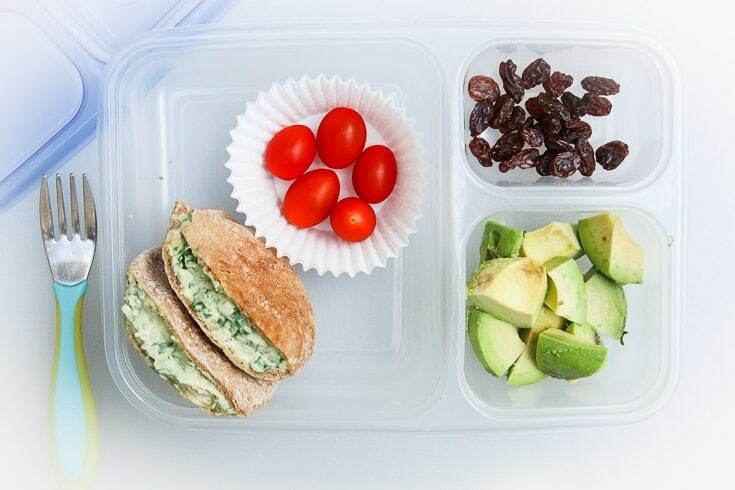 Add an ice-pack to keep the sandwiches cold and mess-free. Use sunflower butter for a nut-free option. For the sandwich, de-pit and scoop the avocado straight onto one slice of bread and mash down with your fork (this will help it stick to the bread). Spread the hummus on the other side, and add thinly sliced cucumbers and spinach leaves in between. Cut it into fourths so it’s mess-free and easier for them to eat. Fruit wraps are from Trader Joe’s. For nut-free option, sub out the Larabar for any other favorite nut-free bar (Enjoy Life Foods or Nature’s Bakery Stone has great allergen friendly bars). For the Bean Burrito Wrap: I always use whole wheat tortilla and add beans, spinach, and these vegan cheese slices (cut into thin strips) + any other add-ins listed below. Mix frozen spinach and corn into the beans. Tomatoes and/or thinly sliced avocado (leave out if it’s going to be too big for the kids to handle). Oven roasted onions & bell peppers (only if I have them from leftovers). To Wrap – Tortilla should be at room temperature. Add the filling, roll up half way, fold down both sides, and continue rolling while making sure contents stay inside. I taught my kids how to hold the burrito so that it doesn’t unfold while eating, so I do not grill them (saves time and avoids soggy burritos). But if you prefer to grill after wrapping, make sure to let it cool completely before packing. Gluten-Free option, use your favorite gluten-free tortilla (may need to grill depending on texture). My kids love the Health Warrior Chia Bars and think of the dark chocolate ones as treats. But feel free to sub-in any other bar or side. For the Tofu: Heat a tiny amount of cooking oil in a non-stick pan. 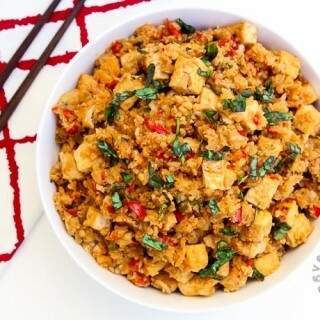 Remove as much excess water as you can from the firm tofu. Cut into cubes and pan fry on medium-high heat until slightly crispy. Sprinkle some cinnamon and/or coconut sugar, mix, and pack in insulated container. Sprinkle salt on the steamed broccoli & diced avocado. The avocado gets slightly brown by their lunchtime, but my kids don’t mind (add a little lemon juice to avoid). For the Quesadillas: In a non-stick pan, saute and grill your favorite thinly diced veggies (onions, frozen corn, zucchini, bell peppers, and/or spinach) on medium-high heat with a little oil. Add in rinsed cooked black beans (from can), and season with salt and garlic powder. Grill the corn tortilla, add mix + vegan cheese (tear the slices into pieces), fold over, and heat until cheese is melted. Let them cool completely before packing. For ease, make this filling the day before (or have it from dinner leftovers). Sub sunflower or pumpkin seeds instead of the almonds for a nut-free option. I use Follow Your Heart vegan cheese slices for the sandwich. Make sure to cool completely before packing. Sub your favorite gluten-free vegan bread. Sub sunflower or pumpkin seeds for a nut-free option. For the Dosa: Make my dosa batter ahead of time. 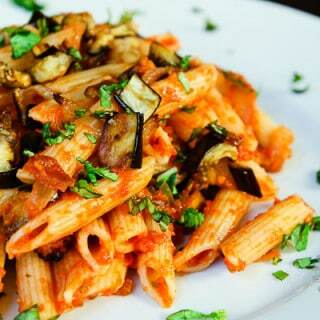 Add in shredded carrots and/or zucchini. 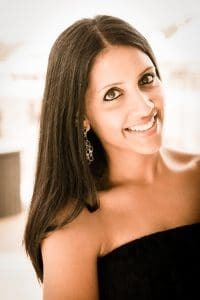 Make the dosa in the morning, lightly spread some vegan butter, and cool completely before packing. Lemony Potatoes – This is from dinner leftovers to go along with the dosa (I’d never be able to make this in the morning), so feel free to sub a bar, trail mix, or some more veggies if needed. This is one of my favorite go-to school lunches, and the kids love it. I make a large batch of dosa batter to use and freeze for quick meals another week. For the Mini-Pita Pockets: In a bowl, mix together finely chopped spinach, finely diced cucumbers, finely diced red bell peppers, and hummus. Cut the tops off of the mini whole wheat pita pockets and fill with mixture. For a gluten-free option, serve the mix with a side of gluten-free rice crackers. Wrap the pita pockets separately in saran wrap to seal (optional). For the Tortilla Roll-up: Lay your favorite tortilla flat. Spread a layer of your favorite vegan cream cheese (I use Tofutti or Kite Hill brands), topped with a layer of fresh spinach leaves, and a sprinkle or salt & pepper (optional). Roll the tortilla up tightly (using some cream cheese to seal) and cut in half. Add an ice-pack to keep the roll-up mess-free. Use tofutti brand cream cheese for a nut-free option. Use Follow Your Heart gluten-free tortilla for gluten-free option. For the Mini-Pita Pockets: In a bowl, mix together cooked small lentils and your favorite fresh brushetta mix (or add in finely diced tomatoes, salt, balsamic vinegar, olive oil, garlic powder). Cut the tops off of the mini whole wheat pita pockets and fill with mixture. To make this easy, I use Trader Joe’s already steamed lentils & fresh brushetta sauce. …and there you have it! 10 Easy School Lunch Ideas that are vegan, healthy, and have gluten-free options! Although my kids love all of these healthy school lunches, I’d say their TOP 3 favorites are #7, #5, and #2! Which ones are your favorites? Hopefully you found a few to try and add into your school lunch rotations, let me know in the comments below! Or if you have any other questions and need additional substitutions, please feel free to leave a comment! For more school lunch inspiration, be on the look-out for another school lunch series coming to the blog. In the meantime, follow me on Instagram and check out my instastories for a glimpse of my kids daily school lunch! I try to snap a quick picture before rushing out the door for some daily inspiration. To make things easier for you guys, I’ve included all 10 easy school lunch ideas in printable format below. Need new and quick school lunch ideas for your kids? 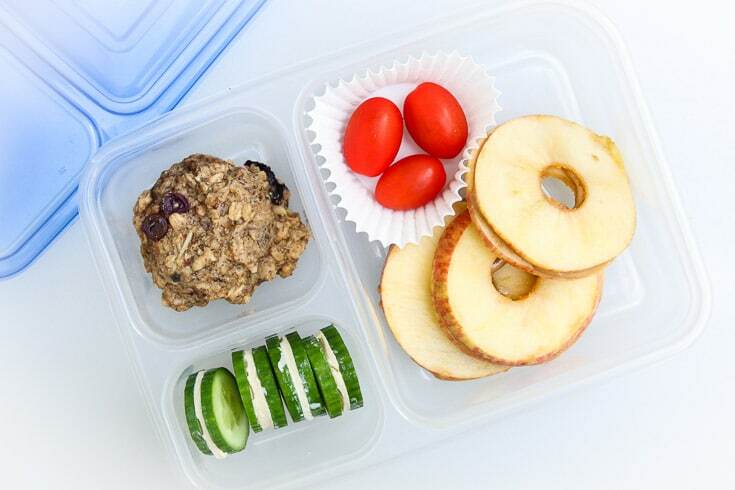 Make things simple this year by checking out these 10 tried-and-loved Easy School Lunch Ideas! They're all vegan, healthy, and include allergen friendly options! Core the apple, cut it into thin slices, and spread your favorite nut-butter in between. I typically use the creamy almond butter or creamy peanut butter from Trader Joe's. Make cucumber and hummus sandwiches. I use Persian cucumbers for smaller one-bite hummus sandwiches. Option to sub in these Pumpkin Pecan Breakfast Cookies. Add an ice-pack to keep cold and mess-free. For the sandwich: De-pit and scoop the avocado straight onto one slice of bread and mash down with your fork (this will help it stick to the bread). Spread the hummus on the other side, and add thinly sliced cucumbers and spinach leaves in between. Cut it into fourths so it's mess-free and easier for them to eat. For nut-free option, sub out the Larabar for any other favorite nut-free bar (Enjoy Life Foods or Nature's Bakery Stone has great allergen friendly bars). For gluten-free option, I prefer Follow Your Heart Oat Bread (toasted). For the Bean Burrito Wrap: I always use whole wheat tortilla and add beans (homemade the day before or from a can to make things easier), spinach, and vegan cheese slices (cut into thin strips) + any other add-ins listed below. Burrito add-ins (optional): Mix frozen spinach and corn straight into the beans, tomatoes and/or thinly sliced avocado (leave out if it's going to be too big for the kids to handle), and oven roasted onions & bell peppers (only if I have them from leftovers). To Wrap: Tortilla should be at room temperature. Add the filling, roll up half way, fold down both sides, and continue rolling while making sure contents stay inside. I taught my kids how to hold the burrito so that it doesn't unfold while eating, so I do not grill them (saves time and avoids soggy burritos). But if you prefer to grill after wrapping, make sure to let it cool completely before packing. For the Tofu: Heat a tiny amount of cooking oil in a non-stick pan. Pan fry tofu cubes on medium-high heat until slightly crispy. Sprinkle some cinnamon and/or coconut sugar, mix, and pack in insulated container. Sprinkle salt on the steamed broccoli & diced avocado. The avocado gets slightly brown by their lunchtime, but my kids don't mind (add a little lemon juice to avoid). For the Quesadillas: In a non-stick pan, saute and grill your favorite thinly diced veggies (onions, frozen corn, zucchini, bell peppers, and/or spinach) on medium-high heat with a little oil. Add in rinsed cooked black beans (from can), and season with salt and garlic powder. Grill the corn tortilla, add veggie-bean mix + vegan cheese (tear the slices into pieces), fold over, and heat until cheese is melted. Let them cool completely before packing. For ease, make the veggie-bean filling the day before (or have it from dinner leftovers). Prepare the grilled cheese. Make sure to cool completely before packing. For gluten-free option, sub your favorite gluten-free vegan bread. For the Dosa: Make my dosa batter ahead of time. Add in shredded carrots and/or zucchini. Make the dosa in the morning (following the directions in the linked recipe), lightly spread some vegan butter, and cool completely before packing. Lemony Potatoes: This is from dinner leftovers to go along with the dosa (I'd never be able to make this in the morning), so feel free to sub a bar, trail mix, or some more veggies if needed. 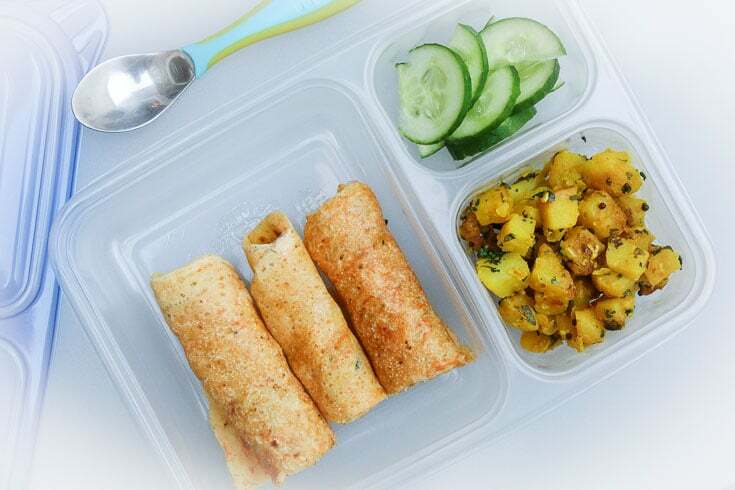 Tip: Make a large batch of dosa batter to use and freeze for quick meals another week. For the Mini-Pita Pockets: In a bowl, mix together finely chopped spinach, finely diced cucumbers, finely diced red bell peppers, and hummus. The ratio of each should be such that the mixture remains chunky with just enough hummus to hold it all together. Cut the tops off of the mini whole wheat pita pockets and fill with mixture. (optional) Wrap the pita pockets separately in saran wrap to seal. To make this easy, I use Trader Joe's already steamed lentils & fresh brushetta sauce. 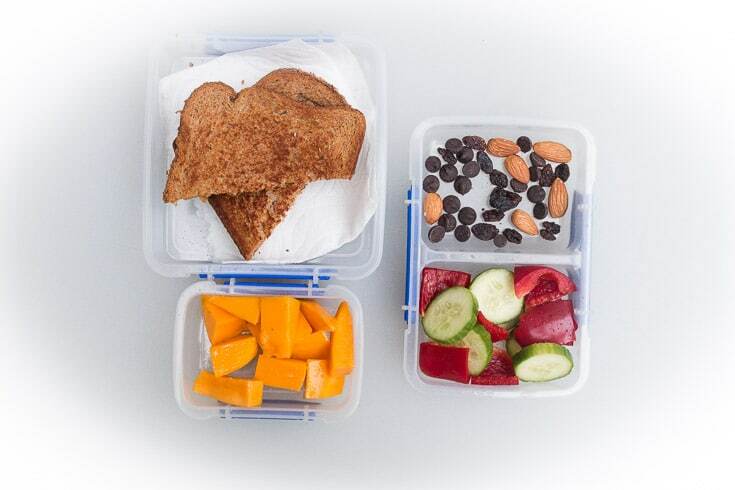 School Snack is always one fruit + something else (such as pretzels, bars, coconut oil potato chips, veggies, sweet potato chips, vegan cheese crackers, banana chips, sesame sticks, roasted seaweed chips, etc.). I'm always look for good lunch ideas and these look awesome! I have the same containers and love them. Thanks Emily! Hopefully you find a few new ones you like! 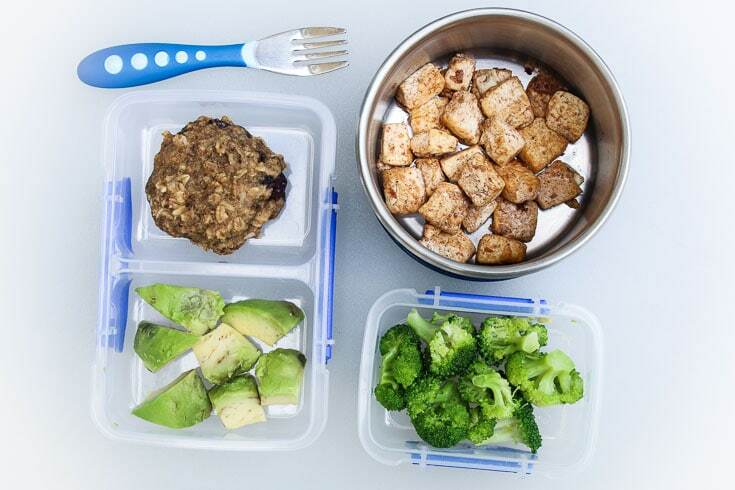 Yes...love the containers...so easy! Sometimes it's hard for me to think of plant based lunch ideas beyond salads so I love this list! So many yummy ideas! Thanks Liz! Hopefully you find a few to try! 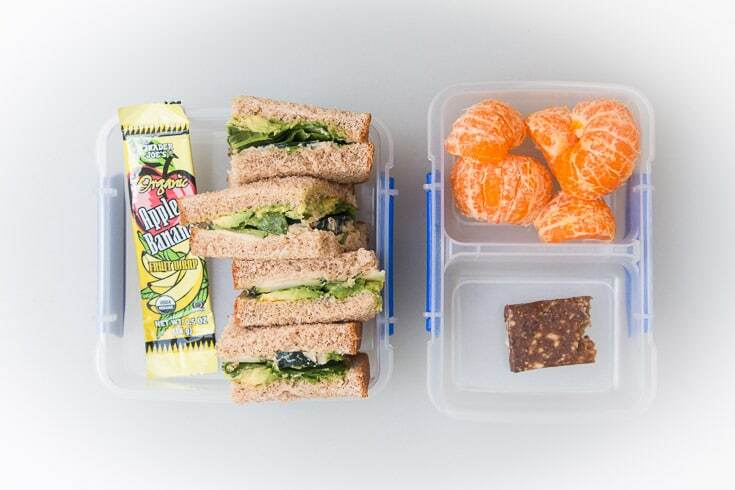 My favourite is the second one, avocado spinach hummus sandwich sounds so good and I love oranges! One of my favorite too! And both kids typically finish that entire sandwich so double yay! Thanks Dahn, very sweet of you to say! Hope they carry the good habits as they grow up! Looove the pita ideas! V is also sick of sandwiches but doesn't know what to ask for...and she's a sloth eater for sure! THANK YOU!!! It'd make my day if she liked one or even two of these ideas!! Let me know! There are so many great lunch ideas in this post. I'd totally eat all of them for lunch! Lunch should never be boring or difficult! Aww thanks Jasmine!! Means a lot! I'm not a kid, but I wouldn't mind having any of these for my lunches! I love the creativity! totally for adults too ha! Whhat i should do is just add a third lunchbox in the mix for myself for later. But of course...that never happens haha. Can you send me a packed lunch everyday please? You have lucky kids! I used to have a sandwich and a bag of chips in my lunch! Ha...would love to! I need to pack a third lunch for myself so i'm not scrounging around the fridge for food during lunch ha! I have a son starting Kindergarten and I'm slowly transitioning him tob vegetarian and soon vegan and I love these ideas. He is so picky but I think he would love the bean burritos. Do your kids enjoy them cold? Oh that's great to hear! Good luck and please reach out to me for more ideas! And yes...they enjoy the burritos cold or room temperature. I think the key is to not heat them up or pack them hot because the moisture gets in and then it becomes a soggy tortilla burrito when it's lunch time which is no fun. Tacos is also an option...it's on there. But again, i make sure to completely let them cool down if i put them on the stove.I have a series of 10 hot lunch ideas coming out soon to prepare more for back to school. If you have ANY questions on these or need more suggestions please don't hesitate to contact me or reach out. I've found that getting kids to eat their lunch is a slow and steady process depending on the type of kid so don't get frustrated :) but happy to help with tips!